On our last night in Chicago, we ate at TRU. Before we even arrived, we knew TRU was going to be a little extra special for two reasons. 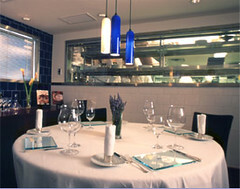 First off, we were able to reserve the Chef's Table, which we have never experienced before at any restaurant. Secondly, their Executive Pastry Chef is Gale Gand. The same Gale Gand who is on FoodTV and has written several books on Erin's favorite topic - desserts. Unfortunately, we didn't get a chance to meet her, she had left for the night right before we got there. When we arrived at TRU, we were whisked off through the kitchen to the Chef's Table. It was enclosed in a small room just large enough to seat 8 people. The room had windows along 3 walls, 2 facing the kitchen and 1 facing the street. We really weren't given much of a tour of the kitchen, but I'm sure they would have provided us with one if we would have asked. I didn't ask because I thought they might have that planned for later - they didn't. No big deal though. The kitchen table is slightly disappointing in the fact that you really can't see a whole lot of action without standing up. The windows are at too high of a level to really see what's going on outside and full length windows wouldn't resolve the issue either because the other side of the wall is being utilized as you can imagine. The only real way to rectify the line of sight issue would be to elevate the room and I don't foresee that happening anytime soon. The reason I mention all of this is because it brings up an interesting problem. How do you integrate a kitchen table that can seat 8 people without: the kitchen being crowded, the guest being uncomfortable, the guest feeling imposing or secluded, or diminishing the feel of being part of the action? Both of the tables available at Charlie Trotter's seem to fail at the ideal. One table is in the corner of their kitchen which I think would be hot and crowded, while the other table is in a completely separate room with closed circuit TV's (admittedly I'm not sure how this setup works). Honestly, the best implementation I've seen of a kitchen table was at Buca di Beppo. They had a small nook in their kitchen which held a 'U' shaped bench with a square table. The bench was elevated, so you had to step up and slide in. This would never work in a fine dining establishment because of the service issues it would create, but it was a good design for that restaurant. Oh, speaking of the kitchen's bane of the 2-way window, my wife caught the kitchen staff pointing, chattering and snickering at us several times due to our (my) insistence on taking a copious amount of pictures of our experience. Granted, she does have a bit of an imagination about such things, but she's also far more observant of surrounding people then I am, so I have the inclination to believe her. However, I did get weird looks from our waiter, I mean "attendant", when I stood up and got closer to the cheese cart to photograph it. So much so, that it made me uneasy to do the same for the Petit Fours Cart, thus the blurry picture. Though, the reason I entirely forgot to photograph the chocolate cart that came after that was because I was too busy enjoying my espresso lollipop. Fighting Fish Bowl - again expected because I'm an information whore and I had scoured the net for pics and reviews before we went. I'm not sure if it was the Souffles or the Homemade Rootbeer Float - which ever one I tried first - the other was just confirmation of that decision. It's hard to describe just how good their desserts are and how deserving Gale Gand is of the praise she receives. I was disappointed that the Bread Pudding wasn't a little more dense and custardy-french-toast like, which is what I'm used to, but everything else was pretty amazing. The cart of Petit Fours and Chocolate just pushed everything else to an almost bliss state. We just couldn't stop smiling. Other highlights of the meal include the Espresso-Roasted Quail, Watermelon-Mint Shooters, the Cheese Cart and the Caviar Staircase which I mentioned before (especially the Wasabi infused Tobiko). What's really neat is the fact that they have about 140 dishes in their arsenal, so you could easily go back several times and never have the same dish twice. Maybe even coming up with your own ultimate menu after you've been there a dozen times! The last bit I'll mention is about their dining room. We only saw the dining room as we were leaving, but it's beautiful. Extremely elegant, modern yet classic with some great artwork. They have taken time and put a lot of money into making the entire experience seem like a piece of art itself. Right down to the bathroom sink.